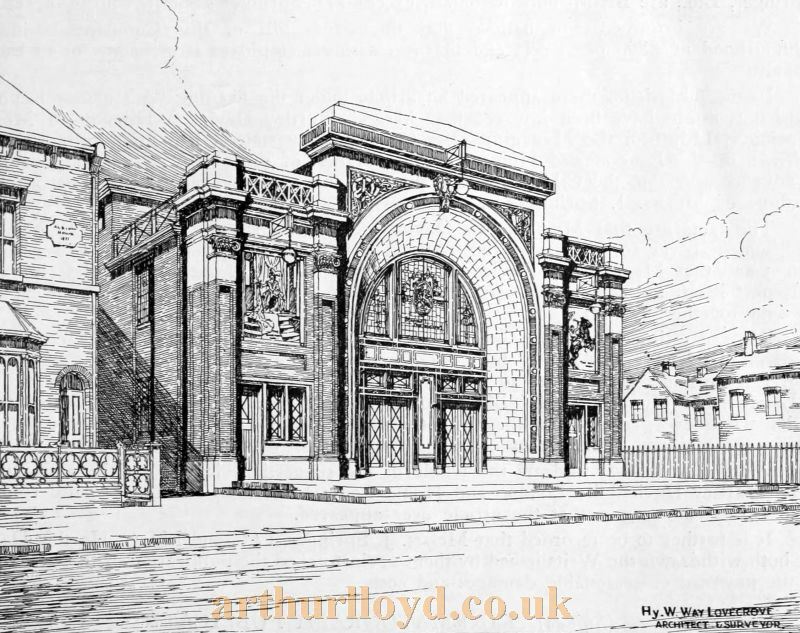 Above - A Sketch of the Victoria Playhouse, Aston, Birmingham from plans by Hy. W Way Lovegrove - From the Supplement to The Cinema News and Property Gazette, January 8th, 1925. The Victoria Playhouse was situated on Victoria Road in Aston, Birmingham and opened on the 16th of December 1924 with the Silent Film 'Cornered' accompanied by an orchestra conducted by R. Arthur Jones. The Theatre was built for A. W. Rogers and designed by the local architect Hy. W. Way Lovegrove. Shortly after the Theatre opened the Cinema News and Property Gazette reported on the new building in their 8th of January 1925 edition saying:- 'The new cinema which has just been erected in Victoria Road, Aston, which has been named "The Victoria Playhouse," was to be opened by Sir Evelyn Cecil, M.P., but almost at the last minute Sir Evelyn found himself unable to leave his Parliamentary duties and the ceremony was dispensed with. This palatial luxurious super-cinema is one of the largest of its kind in Birmingham and the district, every detail of which had been studied almost up to perfection. Mr. Hy. W. Way Lovegrove, 120, Soho Hill, Birmingham, the architect, has built other important picture theatres, but this one undoubtedly does him great credit and ranks second to none in Birmingham. The theatre is built upon an island site 180 feet long by 76 feet wide, and has an auditorium 130 feet long by 54 feet wide, which seats 1,100 people. The balcony, designed by the Birmingham Reinforced Concrete Steel Company, is built of reinforced concrete, between the floor of which and the auditorium floor is suspended the operators' room, rewind room and workshop, the projection being dead central with the picture, and having an ideal throw of 90 feet on to a plastered hollow wall with vents for heating chamber under, enabling the heat to circulate and discharge through vents above the picture, which guards against any condensation. The front elevation is built of dragged grey terra cotta supplied by the Hathern Station Brick and Terra Cotta Company, and relieved with brindled bricks on both sides of the main covered arch, which, together with the beautiful stained glass window supplied by John Gibbs, Limited, forms a special feature on both wings of the elevation, and at a suitable height are two six-sheet poster boards, hinged at the side, enabling the posting to be done with ease and guarding against the unsightly method of covering up features. The main crush hall is 54 feet by 30 feet, leading out of which is the main balcony staircase on one side and balcony exit on the other. The terrazzo floor laid by Pavino Flooring Company, has had great consideration and looks exceedingly well. The first floor is entirely taken up by the directors' room, manager's office, staff and generator rooms. The balcony is approached by a balcony crush lounge, 3o feet long by 22 feet wide, and upon entering the visitor will be much impressed by the beautiful decorative scheme of fibrous plaster and colour carried out by Messrs. Bryan's Adamanta Company, Limited. The scheme of decoration is mauve, blue, and bronze, with a figured frieze under cornice, and is of a conventional style, very bold and striking, but restful to the eyes, the main ceiling has four plaster lanters shedding a soft ruby light when the picture is on. The area of the balcony is 2,214 square feet, and seats 350 people. An auditorium holds 1,116. All the electric equipment is up to date, with curtains in front of screen, moved by electric gear, installed by W. T. Furze and Co., Limited, Nottingham. The seating is of gold and mauve, very comfortable, and is bolted down to the floor both in balcony and auditorium, which does away with the trouble met with when using ordinary coach screws, the seats are 19½ centres and 19½ back to front in balcony and auditorium, and was carried out by Messrs. Turner, King's Heath. The ventilation is obtained by two 130 inch fans in the roof, with trunking to extracts in the roof, and two 20 inch fans under the balcony, trunked and slotted so that the air is moved from all positions without draught. All floors are laid with patent flooring carried out by Messrs. The Pavino Flooring Company, which is noiseless and warm, and does away with carpets. The general contractors for the erection of this cinema were Geo. Webb and Son, Limited, Soho Hill, Birmingham, who were responsible for the whole of the work. This firm rank as one of the leading Midland builders, and undoubtedly they have in erecting this building enhanced their good reputation. The proprietor of the new cinema is A. W. Rogers, and the manager A. F. Chappell, both of whom have been in the business for many years. The above text in quotes was first published in the Supplement to The Cinema News and Property Gazette, January 8th, 1925. The Victoria Playhouse opened on the 16th of December 1924 and was later taken over by the Victoria Playhouse Group, run by A.W. Rogers and his son in law Tom Clarke, who had started in the cinema industry in 1948. Rogers eventually ran nine independent cinemas in Birmingham and Solihull under the Victoria Playhouse Group name. Tom Clarke would go on to become president of the Birmingham and Midlands Cinematograph Trade Benevolent Fund which supported soldiers families during World War One and went on to support their descendants for decades afterwards. His father in law A. W. Rogers, who would open the Victoria Playhouse in 1924, was also one of the founders of the charity in 1916. The Victoria Playhouse was closed on the 3rd of August 1963 with a last showing of the Films 'Ursus in the Valley of the Lions' and 'Where the River Bends'. It was then demolished and the site was used for road widening and housing.